2018 MotoGP Winter Test Valencia - who goes where? Home » Bikes » 2018 MotoGP Winter Test Valencia – who goes where? 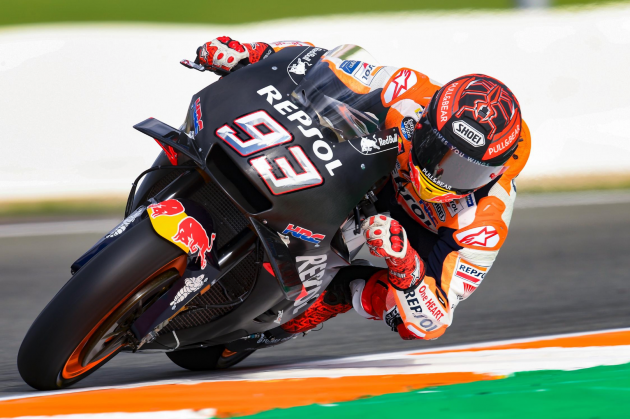 With the conclusion of the 2018 MotoGP season, convincingly won by Marc Marquez (#93) of Repsol Honda Team, the MotoGP circus now moves into Winter Testing phase, held at Circuit Ricardo Tormo in Valencia, Spain. This is the first of two Winter Tests held in 2018, the other being at the Jerez Circuit on 28 and 29 November before the year-end break. Testing resumes in Sepang International Circuit on 6 to 8 February, preceded by a shakedown test on 1 to 3 February. This is followed by the Qatar Test on 23 to 25 February before the 2019 MotoGP season begins in earnest on 10 March at the Losail International Circuit in Qatar. With the beginning of Winter Test, the game of musical chairs for riders has settled down with the biggest change being Jorge Lorenzo (#99) heading over to Repsol Honda Team, joining fellow Spaniard and current MotoGP World Champion Marc Marquez (#93) on the RC213V, taking the place of the recently retired Dani Pedrosa (#26). Lorenzo’s place at Ducati Team is taken by Danilo Petrucci (#9) who joins Andrea Dovizioso (#04), riding the Desmosedici GP19. Ducati’s presence on the 2019 MotoGP grid remains huge with a total of six bikes carrying the Ducati badge. Aside from the factory team, the others are Reale Avintia Racing with Karel Abraham (#17) and Tito Rabat (#53) along with Alma Pramac Racing with riders Jack Miller (43) and Francesco Bagnaia (#63) who moves up from Moto2. New addition to the grid is Petronas Yamaha Sepang Racing Team, with rider Franco Morbidelli (#21) and Fabio Quartararo (#20) on Yamaha YZR-M1s, and functions as a satellite team for Yamaha following the departure of Herve Poncheral’s Tech 3 racing team. Fan favourite Valentino Rossi (#46) remains with Yamaha Factory Racing till at least 2021, and has Maverick Vinales (#12) as team mate. Austrian outfit Red Bull KTM Factory Racing on KTM RC16 race bikes sees Johann Zarco (#5) join Pol Espargaro (#44) in the team. They are joined by Red Bull KTM Tech 3 with Malaysian Hafizh Syahrin (#55) and Miguel Olivera (#88), who comes up from Moto2, in the saddle. Honda’s other satellite team is LCR Honda Idemitsu and LCR Honda Castrol, who share a joint paddock, with riders Takaaki Nakagami (#30) and Cal Crutchlow (#35). The other Japanese factory team on the grid is Team Suzuki Ecstar with riders Joan Mir (#36) and Alex Rins (#42) on the GSX-RR. Also on the grid is famed racing name Aprilia in the form of Aprilia Racing Team Gresini with the Aprilia RS-GP. Riders for the Aprilia team are Andrea Iannone (#29) who replaces Scott Redding (#45), and Aleix Espargaro (#41), brother of Pol Espargaro. There are 19 races scheduled for the 2019 MotoGP calendar with the season opener in Qatar on 10 March. The Malaysian GP takes place on 3 November ahead of the season ending race at Valencia on 17 November.